This follows on from last week’s Underused Names for Girls; to briefly recap, they are names which aren’t common here (used less than six times in the 2012 Victorian data, have never charted in Australia), but still have a history of use in Australia (can be found in historical records). Alaric is from the Gothic name Alareiks, meaning “ruler over all”. Alaric I was the king of the Visigoths who sacked Rome in 410, and his great-grandson, Alaric II, was ruler of the Visigothic kingdom, covering most of Spain and the south of France. Another Alaric was a legendary king of Sweden, skilled in battle and sport, and a masterful horseman. He had a brother Eric, and for some unknown reason, the pair of them killed each other with their horses’ bridles, which seems an awfully strange choice of weapon. The name Alaric is far commoner in fiction than in real life, where it tends to be either chosen for comedies, in the belief that the name Alaric sounds amusingly high-faluting, or science-fiction/fantasy, in the belief that it sounds geekily exotic. In the TV series, The Vampire Diaries, there is a character named Alaric; he says his name uh-LAHR-ik, although most sources say the name is pronounced AL-uh-rik. Powerful and commanding, this is unusual, but sounds similar to familiar names like Alan and Eric. In Arthurian legend, Blaise was the priest who baptised the wizard Merlin, became his tutor and friend, then took the trouble to write down all Merlin’s deeds for posterity. There is a Saint Blaise, who is a saint of healing, as he cures sore throats (the saint was a doctor as well as a bishop). He seems to have been quite popular in England, perhaps because his feast day of February 3 is right after the Celtic festival of Imbolc and the Christian feast of Candlemas, and often marked by bonfires. Blaise sounds like the word blaze, so a pleasing coincidence for fire-lovers. The most famous namesake is Blaise Pascal, the French theologian and philosopher. The meaning could be from either Latin or Greek. If Latin, it means “stuttering, lisping”; if Greek it means “bow-legged”, so either way it’s not flattering. Saint Blaise was Greek, but the Blaise of Arthurian legend is probably meant to be Roman or Romanised, so you can take your pick. It’s a name loved for its sound, namesakes and associations rather than its meaning. Corin is a French surname derived from Quirinus; Saint Quirinus was part of a Roman missionary group sent to convert Gaul, and legend has attached to this popular saint all the standard saintly stories, such as killing a dragon and going for a stroll after getting his head chopped off. The original Quirinus was an early Roman god, probably a Sabine war deity. The Sabines had an altar to Quirinus on the Quirinal Hill, one of the Seven Hills of Rome. The Romans considered him to be a deified Romulus, and in the early days he was a major god, although they gradually lost interest in worshipping him. However, even after the fall of Rome, the Quirinal Hill remained a place of power, so that it was chosen as the seat of royalty, and later the residence of the Presidents of the Italian Republic. The name is linked to the name of the Sabine town Cures, and may come from the Sabine word for “spear”. There is a shepherd named Corin in Shakespeare’s As You Like It, and a Prince Corin in C.S. Lewis’ The Horse and His Boy. You can also see this name from another perspective, for in British legend, Corineus was a great warrior and giant-killer who founded Cornwall; his name may be an echo of Cernunnos, the Celtic god, whose name is usually translated as “horn”, or “horned one”. There are several place names in Cornwall apparently derived from Cernunnos (including Cornwall itself), and the name Corin enjoyed early popularity in Cornwall and Devon – so you can see this as a British name just as much as a French one. This packs a double mythological punch, and doesn’t seem much different than names such as Corey or Colin. Edgar is an Old English name meaning “rich spear”. Saint Edgar the Peaceful was a king of England; a Scottish King Edgar was a son of Saint Margaret. The name became rare after the Norman Conquest, but had a revival in the 19th century, after Sir Walter Scott’s historical novel, The Bride of Lammermoor, told the story of tragic lovers Lucy and Edgar – a tale which ends in madness, murder and quicksand. Edgar is also a character in William Shakespeare’s King Lear; disinherited by his father, he wanders the heath disguised as a babbling madman. Noble and clever, he is also enigmatic with a touch of darkness; he enjoys playing the crazy beggar just a little too much. The most famous person named Edgar is probably the American writer, Edgar Allen Poe, said to have been named after Shakespeare’s character. Poe’s works are also quite dark and enigmatic, dealing with topics such as grief, guilt, mystery, murder, madness, doom, death, drugs, and being buried alive. Edgar is related to the other Ed- names, such as Edward and Edwin, but seems more vintage, a bit edgier, and a touch more Gothic. This name might be uncommon, but it’s also traditional and comes with all the usual Ed and Eddie nicknames. Huxley is an English surname. The Huxley family were Normans who came to Britain after the Conquest and settled in Cheshire, taking their name from a village near Chester, which was originally named Holdesieia, and corrupted into Huxley. The original name may be from the Anglo-Saxon for “sloping land”, and Huxley is believed to mean’s “Hucc’s wood”, with Hucc being an Anglo-Saxon nickname meaning “insult, taunt”. Huxley has been used as a personal name since the 18th century, and early examples are from the Cheshire area, suggesting they may have been named directly after the village. The Huxley family have produced an astonishing number of brilliant thinkers, from the biologist T.H. Huxley, supporter of Charles Darwin, to the author Aldous Huxley, who wrote Brave New World. T.H. Huxley came to Australia as a young man, and did such excellent work in natural history that he was made an immediate Fellow of the Royal Society on his return (Mount Huxley in Tasmania is named in his honour). T.H. Huxley’s distant cousin, Sir Leonard Huxley, migrated to Australia in childhood, and became one of our most distinguished physicists. With its fashionable X and intellectual pedigree, this name seems very hip, and comes with the nicknames Huck or Hux. Jethro is translated as “excellence, abundance” in Hebrew, and in the Old Testament, Jethro is the father-in-law of Moses, and a priest (it is never made clear in what religion he was a priest, but by the end he accepted Yahweh as his God). Jethro is revered as a prophet in Islam, and is held in the highest regard by the Druzes. The most famous person with this name is Jethro Tull, an English agricultural pioneer who helped bring about the British Agricultural Revolution which formed the basis of modern farming practices. The rock band Jethro Tull is named after him. You may also remember the dull-witted Jethro Bodine from The Beverly Hillbillies. Jethro is a little bit hick and a whole lot hip – it’s hickster. Rufus started life as a Roman nickname, but afterwards became a family name; it’s from the Latin for “red haired”. There are many famous men with the surname Rufus, including the Stoic philosopher Gaius Musonius Rufus. His views on philosophy were moderate and practical, encouraging all men and women to follow a philosophical life, and giving advice on all manner of topics, including diet (vegetarian, raw) and hairstyles (long, beardy). He was so highly-regarded that when all other philosophers were expelled from Rome by the Emperor Vespasian, Rufus was allowed to stay. There are at least ten saints named Rufus, one of whom is mentioned in the New Testament as a disciple of St. Paul; his father was the man who carried the cross for Jesus on the way to Calvary. There is also the Gaelic saint Mael Ruba, whose name is Anglicised as either Maree or Rufus. King William II of England was nicknamed “Rufus” for his ruddy complexion. Famous people named Rufus include the Canadian-American singer Rufus Wainwright, and the British actor Rufus Sewell; Roger Taylor from Queen has a son named Rufus Tiger. With names ending in -us becoming fashionable, Rufus looks set to become the new Atticus. Wolfgang is a German name meaning “wolf path, wolf journey”, and interpreted by folklorist Jakob Grimm as being the name of a hero who follows in the wake of the “wolf of victory”. It has two heavy-duty namesakes: composer Wolfgang Amadeus Mozart, and writer Johann Wolfgang von Goethe; there is also a Saint Wolfgang, one of the patrons of Germany. Eddie Van Halen chose this name for his son. Nearly all Wolfgangs in Australian records have German surnames, and although this would make a striking heritage choice, it could work even if you don’t have a scrap of German ancestry. Wolfgang is one of those names that people seem to either love or loathe, so it attracts some extreme reactions. The usual nicknames are Wolf or Wolfie. In the New Testament, Zebedee was a fisherman, and the father of the Apostles John and James. He is mentioned as being left behind in the boat when Jesus called the brothers to “become fishers of men”; we never learn whether he was supportive of his sons’ career change, or thought they should have remained fishers of fish. Zebedee’s wife was one of the women present at the crucifixion. The name Zebedee is the Greek form of the Hebrew name Zebadiah, meaning “Yahweh has bestowed”, and nearly always interpreted as “gift of God”. There is an English painter named Zebedee Jones and an English newsreader named Zebedee Soanes; both these Zebedees were born in the 1970s, when the cult children’s show, The Magic Roundabout, was first on television. 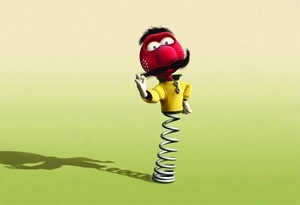 In the show, Zebedee was a jack-in-the-box who is popularly recalled as ended the show by bouncing down out of nowhere and intoning, “Time for bed, children” (although I’m not sure how often this occurred). With Old Testament names for boys becoming a bit old hat, it could be time to consider some of the more unusual New Testament names. This one is full of zest, and the nickname Zeb is as cowboy cool as Zeke and Jed. POLL RESULT: People’s favourite names were Huxley, Alaric, and Corin, and their least favourite were Wolfgang, Zebedee, and Giles. Noooo! Alaric must be kept a secret! I must hog it all to myself! Darn you Vampire Diaries. I’m sorry to tell you this, but all the names were chosen from the search terms – so people are already searching for Alaric as a baby name. And I’m guessing “The Vampire Diaries” ARE to blame. I know a Giles (siblings Lloyd and Penelope), a Huxley (brother Oscar Rama) and a Rufus (sister Phaedra). My best friend Freya was goin to be Wolfgang if she was a boy and my younger sister Scarlett would’ve been Jethro. I went to school with a Giles and a Rufus, and worked with an Edgar. I’ve seen kids around named Blaise, Huxley, Rufus and Wolfgang, so they seem quite contemporary.